Developing an employee incentive plan should include setting tangible goals and creating objective parameters to avoid issues that can lead to morale problems. Working with your staff to solicit input on what will motivate them to perform better, you can create a program that offers your business and employees a win/win situation. The first step in creating an incentive plan is to list your desired outcomes. This will help you determine realistic rewards based on the difficulty and value of the work you expect. For example, offering a $100 gift card to an employee who sells $100,000 worth of products or services might be considered insulting. Setting your outcome goals will also help you create the measurements you’ll use to evaluate employee’s performance related to the reward program. Bring your staff, or at least your managers, into the discussion. Run your ideas by them and let them know you have not settled on the final program. This will help you get ideas for additional goals, measurements to evaluate performance, and reward ideas. Run your final program by department heads or key managers before you announce the plan to the entire company. Don’t create an incentive plan that has an open-ended reward potential for employees if you think you might not have the budget to pay the bonuses, commissions or prizes. In addition to cash rewards, prizes or paid time off, factor in the time it will take someone to create and monitor the program. Remember that if you set a cap on rewards, employees often will stop performing once they’ve hit the maximum reward level. An incentive plan that does not clearly communicate what is required of employees, how they’ll be measured, and what they might earn won't have the desired effect. Put your incentive plan in writing, including start and stop dates, who qualifies, the plan’s goals, how you’ll measure performance, and how incentives will be paid or awarded. When creating sales incentives, take into account the situations of your different representatives. Sale reps who are just starting out have the ability to make larger gains in performance, giving them an advantage in incentive plans based on percentage increases in sales. Reps who have been with you longer or who have larger territories have the advantage over other reps when it comes to generating the highest total sales numbers. To avoid a dilemma, you might offer an incentive that rewards the entire sales team’s performance. 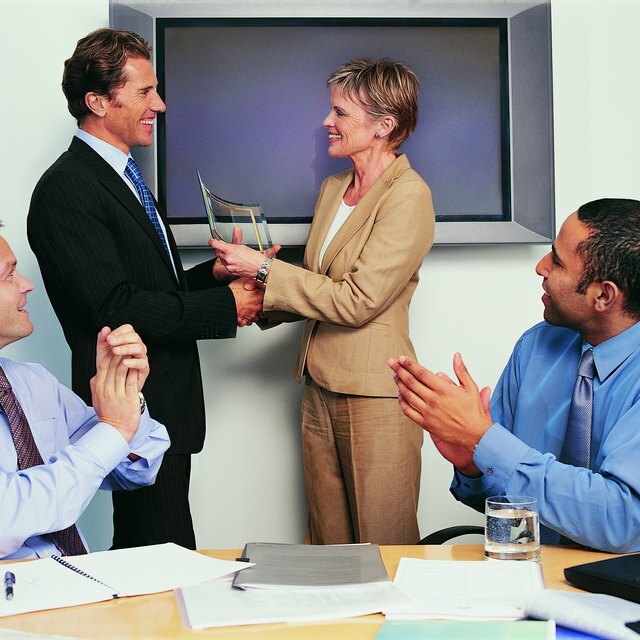 Be careful when creating incentives that reward unquantifiable performance metrics such as “most improved” or “most valuable team member.” These require a manager or the company owner to make a subjective decision, which can lead to accusations of favoritism among employees. Look for ways to set concrete performance benchmarks that can be measured by management and staff alike. Remember that employees have different tastes and interests, so try to avoid a one-prize-fits-all incentive. For example, older workers might prefer dining or entertainment rewards, while younger workers might prefer electronics. Offering gift cards lets winning employees choose the option that’s best for them. You might offer incentives that also benefit your company, such as a fitness center membership, course tuition reimbursement, paid attendance to a professional seminar, association dues, trade magazine subscriptions or certification training.